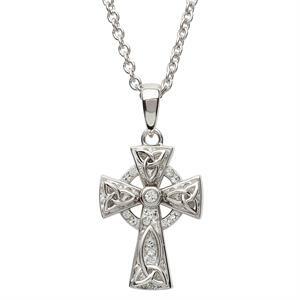 This Celtic Trinity Knot Cross Pendant is embellished with Swarovski crystals and beautifully crafted in sterling silver and made in Dublin, Ireland. It also contains the Irish Hallmark by the Assay Office in Dublin Castle. Comes beautifully boxed with a 18" Sterling Silver Chain. This showstopper necklace features a Celtic cross pendant fashioned in Sterling Silver encrusted with Swarovski® Crystals. Brilliant white crystals adorn the arms of the cross and the halo ring around the intersecting lines. A beaming white, singular crystal shines in the center. Trinity Knot details are featured on each arm of the cross.